This class is full of cool techniques; it will be hard to decide which one is your favorite! First you will stitch your fabric, shrinking it and manipulating it into a textural base. Next you will create a mesh of specialty threads and covered tendrils or branches. Embellishments and embroidery will include hand applied rayon cord, needlelace, shisha mirrors, and beading. Directions will be given to make a four-sided purse; however you could use your own pattern to make a pillow or wall hanging the choice is yours. Skill Level Intermediate: sewing machine, embroidery and beading knowledge needed. Lesson 1: This class is all about the textures! You will learn how to create crinkled and crunched portions into your fabric sections. 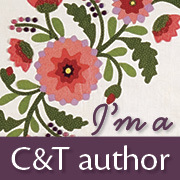 Next you will create textures in other areas with single and twin needle stitching. Lesson 2: This class is all about specialty threads and yarns. First you will make a mesh that can be cut and used as appliquéd sections. Then you will turn ordinary yarn into a tendril or vine. These will be assembled onto the textured fabric sections from Lesson 1 with additional bits of rayon cording and bobbin stitching. Lesson 3: This class is all about the embellishments. Needle lace embroidery, raised and textured stitches, shisha mirrors and bead embellishments will be combined with the previous techniques to create a unique reticule. Scrumptious bits and pieces of vintage laces are melded and stitched together on a base of silk fabric to form a unique and beautiful base for your creative stitched designs. Once the lace scraps are turned into a base, I will show you how to dye the base and a variety of RTD silk ribbons that can be later used in the embroidery and ribbon worked floral vignettes. Skill Level Advanced: sewing machine, hand sewing, embroidery and ribbonwork knowledge needed. Lesson 1: This lesson will cover the design of the collage with bits of lace and silk ribbon that will be stitched onto to a piece of silk for the base. This includes machine and hand stitched details. Only cotton, rayon or silk lace will work for the meld, you will need to know what you have before you start the project. Lesson 2: In this class we will focus on dyeing the melded lace base as well as different techniques that can be used to prepare the ribbons for dyeing. The melded lace base and the RTD silk ribbons for the ribbon work flowers and the silk ribbon embroidery are dyed with the Colorhue dyes, (no other dye will be used or discussed). Lesson 3: This class will focus on the ribbon worked (ribbon cut to a specific length and stitched with a needle and thread), flowers that will become the centerpieces for the floral vignettes. We will cover setting up the vignettes with added bits of dyed appliqués, ribbon scrunched sections, ribbon worked flowers such as the rosette, double edged rosette, berries, fuchsias, hearts, concertina rose, and the prairie lily. 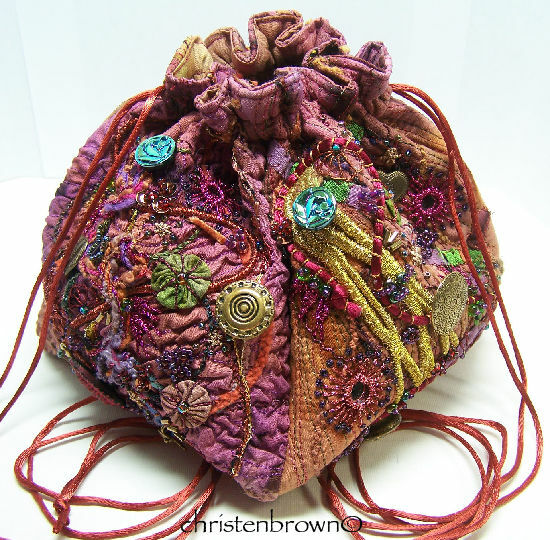 Lesson 4: This class will focus on the silk ribbon embroidery (ribbon threaded through a needle and stitched through the fabric to form a flower or pattern) and traditional embroidered stitches (ribbon or thread stitched into patterns) that will be worked within and around the vignettes. The stitches that will be covered are the outline stitch, feather stitch, woven rose, Japanese ribbon stitch, lazy daisy stitch, bullion-tipped lazy daisy, couched thread tendrils, and the French knot. Lesson 5: This class will focus on the extra embellishments that you can add onto your piece such as simple beaded centers, buttons, charms and trinkets. We will also discuss the finishing touches and details that can be added to your project. Are you the frilly type of girl, who loves lace, blossoms and corsages? In this class I will show you a few different techniques that will take bits of lace and magically transform them into five different blooms. The techniques include individual pieces cut or folded into a petal, then sewn into a flower. 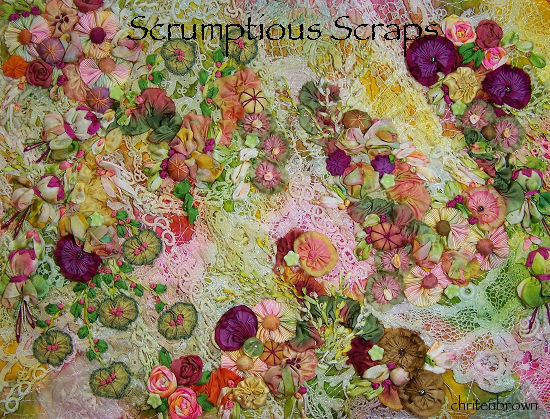 Another technique is similar to my Scrumptious Scrap classes, creating a length of scrumptious bits that is turned into a flower. 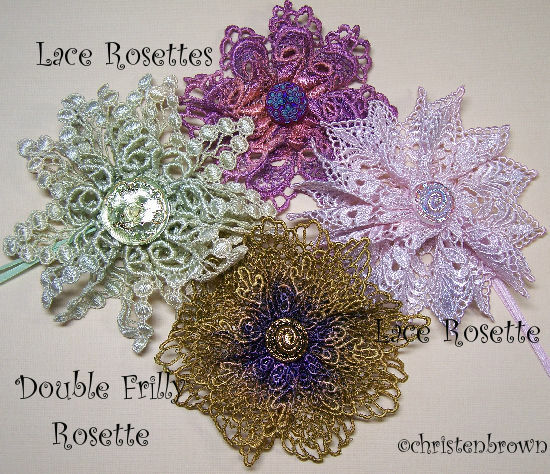 Then some easy peasy rosettes are created with lengths of Viennese lace and ribbon. Each of the blooms is finished off with buttons or a bit of bling. These will make wonderful gifts! Colorhue dyes will be used in this class; no other dyes will be discussed. 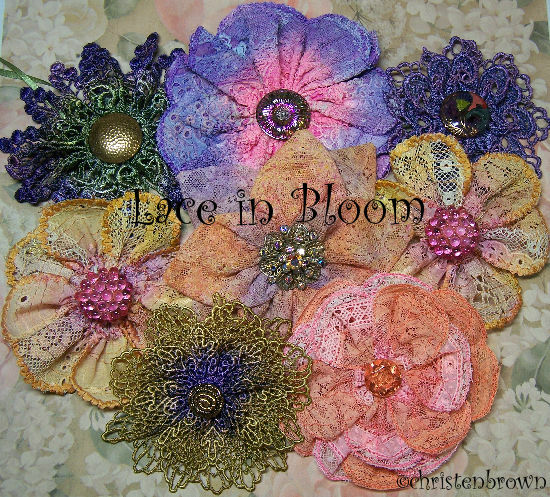 Lesson 1: This class will transform your bits of lace into a fabric mesh or strip of fabric to be cut into petals. Then you will dye these pieces and the other lengths of lace that will be used for flowers. Lesson 2: In this class you will transform your dyed laces into beautiful one-of-a-kind blossoms, using a few different petal shapes and techniques. 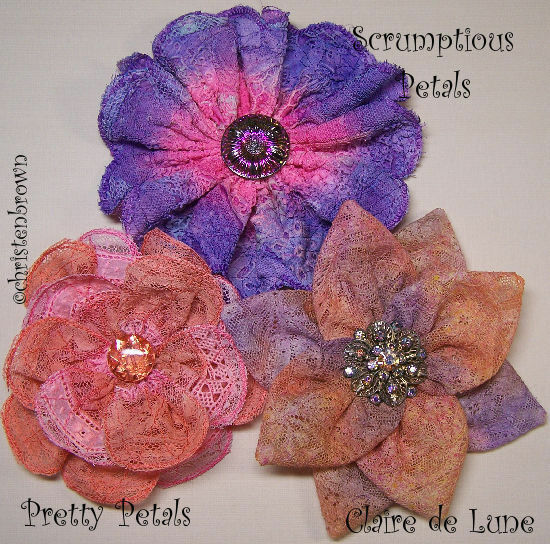 The flowers include Claire de Lune, Pretty Petals, Scrumptious Petals, Lace Rosettes and Frilly Double Rosettes. 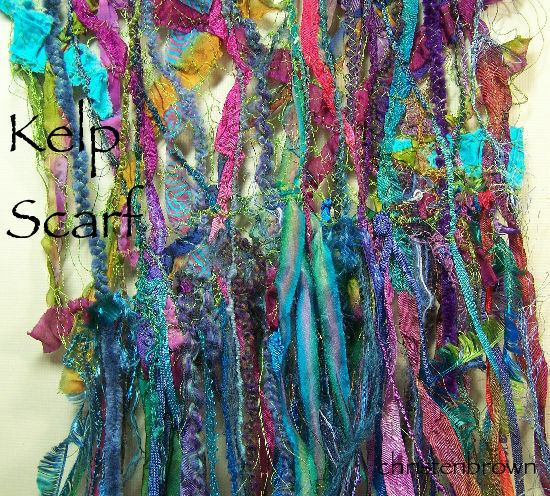 This is truly a one of a kind scarf, that you can make with practically any fiber that you have on hand. You will make a stitched “mesh” using a Solvy base, and strips and scraps of fabric, decorative yarns, ribbons and metallic or rayon threads. The result will be a lightweight, colorful scarf that can be worn all year round. Fringe can be added at the ends for extra flare. Lesson 1: In this class you will learn about working with rayon and metallic threads and using these to make your “mesh”. I will give you ideas on how to cut or strip your fabric, then stitch these onto the base. Lesson 2: In this class I will show you how to incorporate the decorative yarns and ribbons to further enhance your scarf. The last step is to add the fringe and voila you are done!